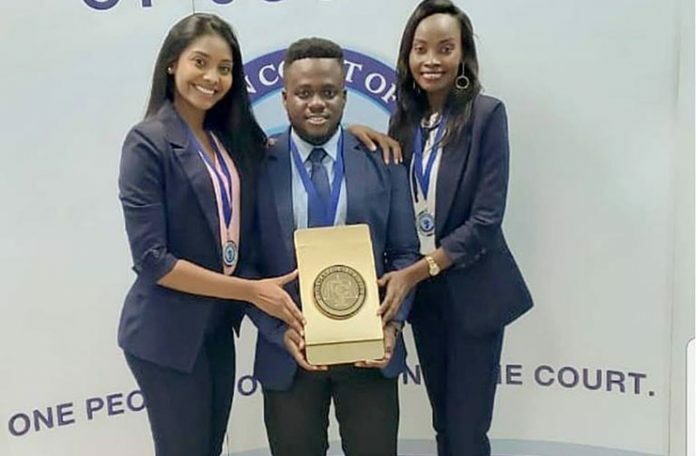 STUDENTS of the University of Guyana (UG) outshone several other teams from across the Caribbean to emerge the Best Academic Institution at the Caribbean Court of Justice (CCJ)’s Law Moot competition. The students, all of the Faculty of Law, were Reon Miller,Senior Counsel; Cassandra Jaikaran, Junior Counsel; and Shameza David, Researcher. Former Chancellor of the Judiciary, Justice Carl Singh was the team’s adviser. “It’s the first time in the competition’s 11 years that UG has won Best Academic Institution,” Miller told the Guyana Chronicle. In an emotional social media post, he explained that for about 10 long weeks, the team worked to prove to the Caribbean Community that UG is no “back alley institution”. “From the 14-hour-long practice sessions and the constant feeling like our argument wasn’t good enough, two second and a first-year student beat the odds,” he shared. In addition to copping the best academic institution spot, UG took the runners-up spot for the moot competition, losing only to this year’s winners: The Hugh Wooding Law School. The Guyanese contingent competed against eight teams from different schools across the Caribbean: Hugh Wooding Law School (Trinidad & Tobago); Norman Manley Law School (Jamaica); Faculty of Law of the Anton de Kom University of Suriname; Faculty of Law of the University of the Bahamas; Faculty of Law of the University of Technology (Jamaica); Faculty of Law of the University of the West Indies (Cave Hill); Faculty of Law of the University of the West Indies (Mona); and the Faculty of Law of the University of the West Indies (St Augustine). Each of the teams was pitted against the other for one round, and Guyana faced the UWI Mona – Faculty of Law, where it emerged victorious. “…The Law Moot presents an opportunity for students from regional law schools and faculties to have hands-on courtroom experience at the CCJ,” the CCJ’s President, Justice Adrian Saunders explained to Nation News (Barbados). “This allows them an opportunity to develop and present their arguments in front of a panel of CCJ judges, and to use our court management system (Curia). The Moot also promotes greater familiarity with the CARICOM Treaty and the Original Jurisdiction of the Court,” he explained further.